EU legislation means that in all EU states there are structures providing employee representation in the area of health and safety. However, there are differences in how this representation is organised. A combination of employee health and safety representatives with their own powers and a joint employee/employer committee is the structure used most frequently, but other states only have joint committees, some only have employee representatives, while in others the existing works council plays the key role. The way employee health and safety representatives are chosen also varies: in around half of the countries they are elected directly by the workforce, while in the others existing bodies, such as unions or works councils, choose them. There are also variations in the thresholds for choosing representatives and setting up committees as well as in their powers. The Health and Safety at Work Framework Council Directive 89/391 adopted in 1989 requires all member states to ensure that employees are informed and consulted about health and safety matters at the workplace, allowing them to make their own proposals for improvements and changes. This consultation can be with employee representatives rather than with employees themselves, and the directive makes that clear these representatives must have appropriate rights and safeguards. With this European legislative framework there are certain aspects of employee representation in the area of health and safety that are common across EU member states. However, there are also many points of difference. These reflect national developments in health and safety – many countries had their own lengthy history of legislation in this area before the 1989 directive – and overall national structures of employee representation. The way health and safety representation is organised can be divided into four broad categories, although the particular national characteristics of each system mean the divisions between the categories are not always precise. The most frequently used model is a combination of employee health and safety representatives, elected or chosen in some other way, who have their own specific rights, plus a joint employee/employer health and safety committee. The members of this joint committee are typically the employee health and safety representatives, on one side, and, on the other, the employer (or a representative) plus the health and safety professionals in the company (occupational physician/works doctor, safety expert and so on) and, in some cases, other managers. It is important also to note that a joint committee is often only required in larger workplaces. A total of 13 countries use this model (Croatia, Cyprus, Estonia, Finland, Hungary, Ireland, Poland, Portugal, Romania, Slovakia, Spain, Sweden and the United Kingdom), although with some important variations. In Hungary, for example, there can also be an employee-only committee of health and safety representatives. In Portugal, joint health and safety committees can only be set up where there is a collective agreement to do so. In Ireland a joint committee is only set up if the employer agrees.In the UK there are separate arrangements for union and non-union workplaces – in non-union workplaces it is the employer who decides whether there will be representatives and there is no right to call for a joint committee. In Poland, there is a joint committee and elected employee health and safety representatives, but these elected representative are only allowed where a union is present. A second model is where employee health and safety representation is provided through the employee members of a joint employee/employer health and safety committee, and there are no separate health and safety representatives with their own rights. Four countries are in this group (Belgium, Bulgaria, Denmark and Lithuania). This is also the structure in public services in France, although not in the private sector, where, since changes introduced in 2018, health and safety is primarily dealt with through a works council type structure (see below). A third variant is where the structure provides only for employee health and safety representatives not a joint employer/employee committee. Five countries use this model (the Czech Republic, at least in some cases – see below, Greece, Italy, Latvia and Malta), although in the case of Greece and Latvia, there is also an employee-only committee in larger workplaces. Although these countries do not have a joint committee as such, in two states the legislation provides for regular meetings between the employer and the employee health and safety representatives – in Greece they should be every three months, in Italy once a year. The Czech Republic fits into this category, in that there is no joint employer/employee health and safety committee. However, under Czech legislation, employee representation in the area of health and safety can be provided either through elected representatives or through the existing workplace trade union organisation. It is the employees who decide whether they want elected representatives – a third of them must request it – and it is possible for both union representation on health and safety and elected health and safety representatives to coexist in the same workplace, although their powers are slightly different. The final model is where health and safety issues are primarily dealt with through the existing representational structure for other issues (often through a works council). Six countries (Austria, France, Germany, Luxembourg, the Netherlands and Slovenia) are in this group, although, again, there are important variations. In the Netherlands and Slovenia, the works council plus, in some cases, a subcommittee is all that exists. In Austria and Germany, on the other hand, there is also a joint employee/employer health and safety committee, as well as health and safety representatives/delegates, who are appointed by the employer but with the involvement of the works council see below. In Luxembourg, where overall employee representation is now exclusively through employee delegates rather than a works council, there is a single employee representative with specific health and safety tasks alongside the employee delegates. In France (but only in the private sector), the social and economic committee (a works council-like body) has, since 2018, replaced the former separate health and safety committee as the body dealing with health and safety issues, although in larger companies a special health and safety committee must also be set up. Further reading: 'Health and Safety representation in European Workplaces' in ETUI and ETUC (2015) Benchmarking Working Europe. It is not just the structures that are different. The way that employee representatives dealing with health and safety are chosen also varies from country to country. There are six states where representatives are chosen, or can be chosen, by the union, although the details vary. In Sweden and the UK, health and safety representatives are appointed by the union; if there is no union they are elected by the whole workforce, although, in the UK, only where the employer wants this. In Italy, health and safety representatives are elected in small workplaces and chosen by the union structure in larger ones. In Slovakia, it is the union or works council that makes the recommendation, with election as a fall back if there is no union or works council, and, in the Czech Republic, the union makes its own choice, although the employees, if they wish, can also elect representatives. In Poland, the employee members of the joint committee are chosen by the union, or elected if there is none, but the health and safety representatives, who can only be present if there is a union, are elected by the whole workforce. Public services in France also fall into this group: employee members on health and safety committees are designated by the unions in line with their support in more general workplace elections. However, this is not the case for the French private sector. For the private sector, France is one of the seven states, where employee representatives dealing with health and safety are chosen indirectly by the members of existing representational structures. It is now the social and economic committee that chooses and provides all the employee members of the specialist health and safety committee, which must be set up in larger workplaces in the French private sector. In Luxembourg and Spain, existing employee representatives choose the health and safety representatives and in the Netherlands and Slovenia, it is the works council that both chooses the members of the health and safety subcommittee, where it exists, and makes up the majority of its members. The situation is slightly different in Austria and Germany. In both these countries, the employee representatives on the joint committee are chosen by the works council, but not the individual health and safety representatives/delegates, who are appointed by the employer. In Austria the works council must agree to the appointment, while in Germany the works council must be informed but the employer takes the final decision. Finally, in both Slovenia and Spain, the law provides that, if there are no existing representational structures, safety representatives can be directly elected. A brief description of the position in each country is set out in the table, although these are inevitably truncated and to get a more complete picture it is necessary to read the individual country reports. There are also differences in the employee thresholds required before a health and safety representative must be appointed and before a health and safety committee must be set up (see table). Among the 21 states with safety representatives or delegates, including those in Austria and Germany appointed by employers, there are seven (Greece, Ireland, Italy, Poland, Portugal, Slovakia and the UK) where there is no employee threshold for their appointment, although in Poland there must be a union. Among the rest, the most common threshold is 10 – applied in five countries (Czech Republic, Estonia, Finland, Malta and Romania), either in legislation or in practice – with Austria close at 11. In three countries, (Cyprus, Latvia and Sweden), the threshold is five. In Spain the threshold is six and in it is Luxembourg 15. In a further three, Croatia, Germany and Hungary the threshold is 20, with the number being reduced from 50 in Hungary in 2016, following an increase in the number of accidents at work. The thresholds for a joint health and safety committee, in the 20 states where these exist, vary less and are generally higher. The commonest threshold is 50 employees, found in eight countries (Belgium, Bulgaria, although five employees are sufficient for a working conditions group, Croatia, Estonia, Lithuania, Romania, Spain and Sweden). In Cyprus and Denmark the threshold is 10, and in Finland, Germany and Hungary it is 20. At the other end of the scale, joint health and safety committees need only be set up when there are 100 employees in Slovakia and Austria (250 in offices), 250 in Poland and 300 in the private sector in France (50 in public services). 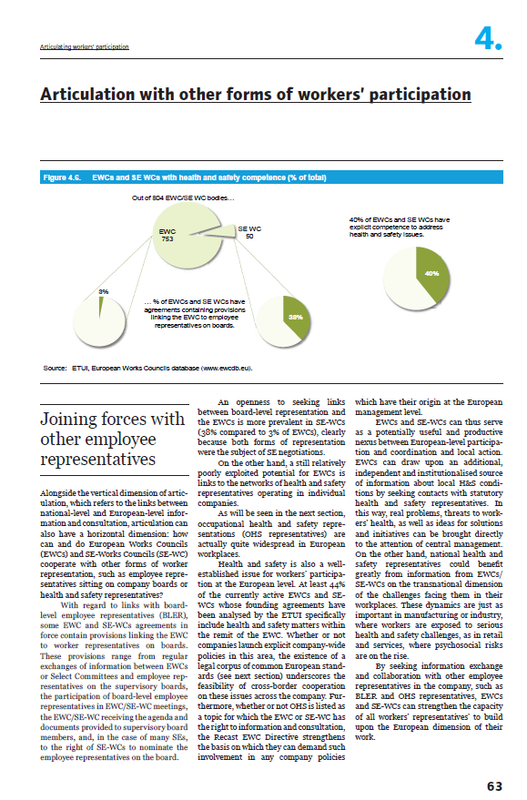 In Ireland, Portugal and the UK there is no set threshold for joint committees, although they require the agreement of the employer in Ireland, depend on a collective agreement in Portugal and are only obligatory in unionised workplaces in the UK. In the two countries where health and safety committees consist only of employees, the thresholds are 50 employees in Greece and 10 employee health and safety representatives in Latvia. In the vast majority of countries, health and safety representatives only cover the workplaces or companies where they are employed. The two main exceptions are Italy, where a so-called area safety representative can be chosen to cover smaller companies without their own safety representatives, and Sweden, where regional safety representatives can exist alongside workplace safety representatives for workplaces with fewer than 50 employees. The terms of the EU directive mean that there is considerable commonality in relation to the tasks and rights of employee health and safety representative and health and safety committees, although there are also some differences. One important question is whether they have a right to require work to be suspended in a way that goes beyond the terms of the directive, which says that workers should not be disadvantaged if, faced with a “serious and imminent” danger to themselves and/or others, they take appropriate steps to avoid that danger. The countries where employee health and safety representatives clearly have further powers are: Denmark (where the joint safety working group can require work to be halted) Estonia, Finland, Poland, Spain (where it is the existing employee structures that have the right) and Sweden. The individual country reports provide greater detail on the tasks and rights of employee health and safety representative and health and safety committees, as well as their rights to time off and their protection against dismissal. 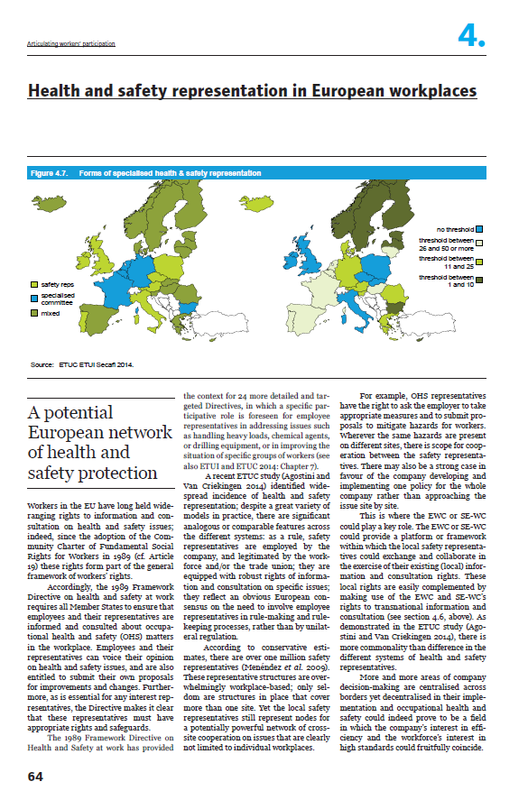 You may also be interested in reading about the links between European Works Councils and the health and safety topics: in ETUI and ETUC (2015) Benchmarking Working Europe. L. Fulton (2018) Health and safety representation in Europe. Labour Research Department and ETUI (online publication). Produced with the assistance of the Workers' Interest Group of the Advisory Committee for Safety and Health at Work (of the EU Commission). Online publication available at http://www.worker-participation.eu/National-Industrial-Relations. This section summarises key features of the way industrial relations are arranged in the different member states. Information covers the following topics: trade unions, collective bargaining, workplace representation, board-level representation, European-level representation, health and safety representation and financial participation. It also includes a list of useful links for each country.